Positioned on the fringes of the Ranthambore National Park, the Tiger Den Resort is one of the finest options of stay for tourists. 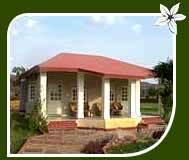 The resort spreads over 5 acres of lush foliage and has to offer 18 air-conditioned cottages including 2 suites. 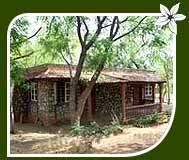 The luxury cottages of the resort provide complete comfort and overlook the ranges of the Aravali Mountains. Twenty-four hours back-up, hot/cold running water, multi-cuisine restaurant and barbecue facilities are available here. To make your evening special, the resort also arranges cultural performances by village artists. You can also spend some quality time around bonfires relishing the tastiest of cuisines. Jungle safaris into the Ranthambore National Park, accompanied by expert guides, are also organised for your convenience. This secluded resort enjoys a wonderful setting. The cottages at the resort come along with all the basic amenities and sport traditional Rajasthani décor. Replete with modern amenities, the cottages at the resort are spacious and comfortable. The restaurant offers the opportunity to tickle your taste buds with cuisine including Indian, Continental and Chinese. A well-maintained bar is also there to provide you with the choicest of wine and beer. Other attractions for tourists include nature walks, cultural programmes, bonfires etc. 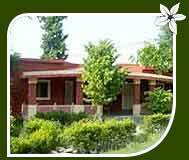 The resort also organises sightseeing tours and safaris into the Ranthambore National Park. The resort is positioned on the Ranthambore Road. It gets its name from a Hindu ruler called Hammir. The Sawai Madhopur Railway Station is just a 20-minute drive from here. The wildlife resort has spacious rooms that boast traditional Rajasthani interiors. The rooms are air-conditioned and have a constant supply of hot/cold running water. Dining is a delightful experience here. The multi-cuisine restaurant offers a range of toothsome Indian and international cuisines. The resort also features a souvenir shop. Camel rides, sightseeing tours and cultural programmes are other attractions for tourists. The renowned Taj Group of Hotels owns the lodge. Built in 1930 AD, the lodge is spread over an area of 12 acres. Landscaped gardens all around add much to the charm of ones stay. To attend to your needs are 27 tastefully appointed guestrooms including 2 suites and 6 tents. The rooms and suites are equipped enough to take care of your stay needs. There are facilities like satellite TV, telephone, 24 hours hot/cold water supply, writing desk, mini bar, dressing table etc. The restaurant at the lodges serves you with mouth-watering Indian and international cuisines. Swimming pool, spa, badminton/tennis courts and Ayurvedic massages are the other facilities available. During your stay here, you can enjoy a number of recreational and adventure activities like nature walks, cycling, jogging and wildlife trips. The resort was built with a view to facilitating his hunting expeditions. It is set amidst wonderfully laid out gardens and lush foliage. 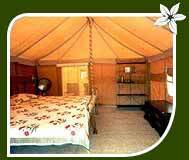 There are 12 tastefully appointed tents to cater to the needs of travellers. The tents at the Sher Bagh Resort are both luxurious and spacious. They come along with facilities like spacious bedroom, verandah, attached bathroom, king-size bed, wooden chaste, antique furniture and hot/cold running water among others. Tourists can savour delicious Indian and international cuisine at the multi-cuisine restaurant. Other facilities at the resort include a well-kept library, spa, Ayurvedic massage, health club etc. 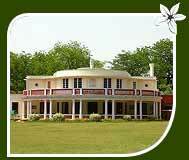 The resort also arranges regular safaris into the jungle of Ranthambore.